Visiting the Puerto Vallarta Malecon is a must during your next trip or vacation. This world famous boardwalk stretches out over 16 blocks and covers the length of historic downtown Puerto Vallarta. The Malecon features many beautiful boutiques, gift shops, restaurants, nightclubs and specialty stores. Many street performers will put on shows throughout the day and the evenings for free. Along the beach here, you will find some of the best sand sculptures that you have ever seen. You will not be disappointed if you decide to spend a day or two here. With the recent upgrades to the boardwalk, vehicles are no longer allowed. It now has a new pier and a walking bridge to Cuale River Island. There is also a 1 kilometer stretch of free WiFi as well. So bring your laptop to the Malecon and enjoy the gorgeous scenery. Walking along this seaside boardwalk will give you a great idea to the diversity of the people and culture here in Puerto Vallarta. From early morning until late at night families, tourists and locals enjoy the sights, sounds and delicious smells on the Malecon. Every Tuesday from mid November till mid April, there is a free Art Walk Tour. This starts at 9:30 am and it takes about two hours but is well worth your time. This event begins at the Galeria Pacifico and is hosted by the owner Gary Thompson. This free tour allows you to meet some of the sculptors and hear them talk about their works of art. There is also tons of history to enjoy along this boardwalk. If you are a history lover, you can hire a guide to tell you all about the history of this seaside promenade. 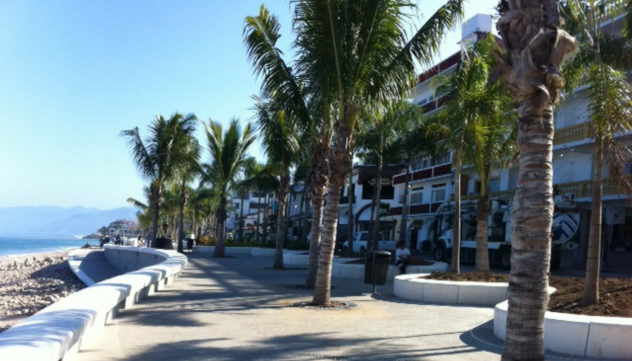 One such example is the The Hotel Rosita, which is located at the north end of the Puerto Vallarta Malecon. This hotel and its restaurant was visited by Hollywood icons John Houston, Elizabeth Taylor, Richard Burton and Eva Gardner.